Peter Brötzmann, alto, tenor, baritone saxophones, tenor sax mouthpiece, a-clarinet, e-flat clarinet; bass clarinet, tarogato. Recorded 21/22/23 August 1984 by Jost Gebers in Bremen. Cover design by Brötzm; cover photograph (reproduced above) by Kenn Michael. 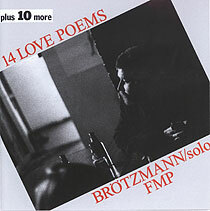 Tracks 1-14 originally issued on LP as FMP 1060.